Clemson, SC – Clemson returned to the practice fields behind the Jervey Athletic Center on Monday for two more workouts. The Tigers conclude the two-a-day portion of the preseason on Tuesday, as the academic year at Clemson begins on Wednesday. The Tigers worked for three hours in the morning, then two hours and a half in the evening. Clemson made a significant change in its defensive alignment on Monday, moving Braxton K.Williams from the star safety position to the weakside linebacker position. The move was made necessary when starting weakside linebacker Altroy Bodrick suffered a torn ACL during Saturday afternoon’s scrimmage. Bodrick, a senior, will be lost for the season, but will return for 2002 because he has never red-shirted. With Williams move to weakside linebacker, sophomore John Leake is now the starter at star safety. 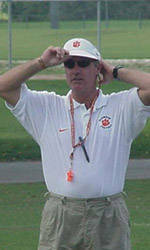 Clemson defensive coordinator Reggie Herring also suffered an injury on Saturday. The demonstrative defensive coordinator suffered a torn Achilles tendon while exhorting his defense during the scrimmage last Saturday. He will have surgery on Wednesday, but is not expected to miss any games or practice. In fact, he will continue to coach the defense from the sidelines while wearing a cast and working with crutches. Gary Byrd was in a yellow jersey for Monday’s practices due to a sprained ankle. Fellow starter in the offensive line T.J. Watkins was out with a sprained knee. Morgan Woodward, who also suffered a sprained knee in the scrimmage, was also in a yellow jersey on Monday. Derrick Brantley was a third starting offensive lineman on the injured list in the afternoon. He suffered a sprained knee in the Monday morning practice. Freshman Eric Coleman, who had been working at tight end, was moved to offensive left tackle.